Basel, Switzerland – March 26, 2009 – RITMO MUNDO, the Rodeo Drive Beverly Hills, Calif.-based luxury watch manufacturer, today announced new additions to its collection here at the 2009 BASELWORLD International Watch and Jewelry Show, taking place from March 26, 2009 through April 2, 2009. 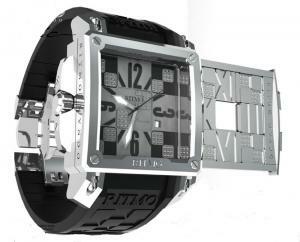 Celebrating its 7th year anniversary, and despite the difficult market environment RITMO MUNDO is actually expanding its collections to bring to the market place innovative products along with value orientation. o Puzzle 501 – all time machines are an instrument of seeing time. The puzzle reverses the role of the the traditional watch. The objective of most watches is to see the time. Not the Puzzle. The automatic movement time can’t be seen until the Patent Pending lever on the right hand side slides out to reveal the time. Aside from this feature, the Puzzle also has 9 moveable square parts that move to allow different portions of the watch to be revealed. Or, if you are bored, you can play the puzzle game. Moreover, the Puzzle features the traditional RITMO lugs with open air design. A puzzle is a problem or enigma that tests the ingenuity of the solver. In a basic puzzle one is intended to piece together objects (puzzle pieces) in a logical way in order to come up with the desired shape, picture or solution Herein, RITMO has redefined in 2009 the role of the watch with the Puzzle. – Yellow gold plated brushed with case and stainless steel puzzle top and polished yellow gold plated and ip black puzzle with diamonds applied.